Born in Pargue, Hollar enjoyed virtual monopoly as an etcher in England where there was no native tradition in etching. This print was commissioned for John Ogilby's 'The Entertainment of Charles II in His Passage Through the City of London to His Coronation' (1662). The setting is the choir of Westminster Abbey. 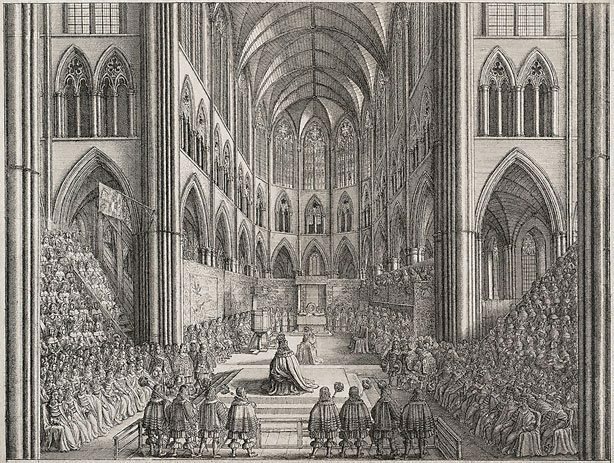 The king is seated on a dais in the foreground and is also shown seated farther on, at the moment of being crowned.